Asthma has become the most common chronic disease among children and is one of the major causes of hospitalisation of children under the age of 15. In the period 1999–2004, asthma prevalence among children in the EU varied from less than 5% to over 20%. 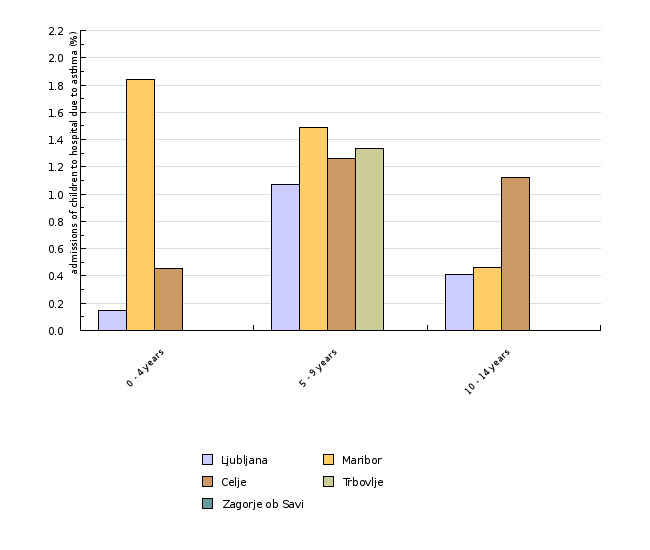 Most hospital admissions of children with asthma occur in Ljubljana and Maribor. As more and more people are sensitive to allergens, allergic diseases may increase in Europe in the coming years. Recent evidence supports the relationship between exposure to air pollution and exacerbation of asthma, mainly due to exposure to particulate matter (PM10). This indicator shows the proportion of admissions of children to hospitals due to asthma by various age groups (0–4 years, 5–9 years and 10–14 years). 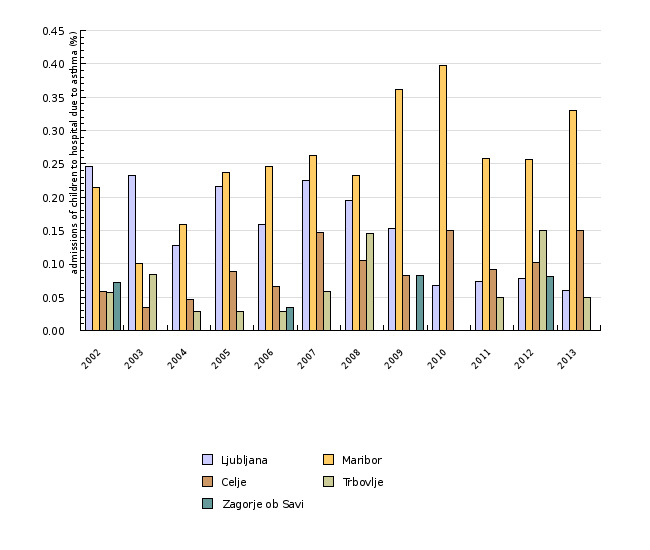 The data covers the period from 2002–2007 and the cities/towns of Ljubljana, Maribor, Celje, Trbovlje and Zagorje ob Savi. For the purpose of comparison with the EU, the indicator contains data on prevalence of asthma, allergy inflammation of the mucous membrane of the nose and conjunctivitis in selected EU countries for the period 1999–2004. Traffic-related air pollution causes asthmatic attacks in children and very probably an increased incidence of and mortality from cardiovascular diseases (Health Effects Institute, 2010). ENHIS - European Environment and Health Information System, 2007.
to reduce the level of air pollution with particulate matter, ozone and nitrogen oxides. Asthma is a chronic inflammatory disorder produced by allergies, viral infection of the respiratory system or airborne irritants. Exposure to various asthma triggers (viruses, tobacco smoke, polluted air, mites, mould) (Hakimek and Tripodi, 2013) causes occasional and temporary narrowing of the respiratory tract, which is manifested in difficult breathing, wheezing in the lungs and coughing (Šuškovič and Košnik, 2006). The symptoms of allergy inflammation of the mucous membrane of the nose and of conjunctivitis are sneezing, blocked nose and itchy nose, eyes or throat. The development of asthma and allergy disorders in children is a consequence of the complex interaction of the environment, genetic factors and the immune system (Marshall, 2004; ISAAC Steering Committee, 1998). Asthma is a significant childhood illness and the major cause of hospitalisation of children under 15 years of age. An increased risk for asthma exists for children living in damp and mouldy environments. Children permanently exposed to mites, house pets and tobacco smoke from their parents are also more likely to develop asthma. For children exposed to allergens in the indoor environment, the risk of developing asthma and allergy disorders is several times higher compared to other children. Gender has an important role in asthma development – in boys, asthma most often develops before puberty, while in girls, it usually develops during puberty and in early adulthood (Soto-Ramirez, 2013). Exposure to allergens may trigger asthma attacks or may exacerbate asthma. The most important indoor allergen is house dust, i.e. dust mites. Their development is significantly influenced by the level of relative humidity – which must be higher than 50% – and the presence of carpets, woollen materials and similar furnishings. Exposure to high indoor concentrations of mites doubles the probability of developing hypersensitivity in children, which eventually leads to asthma. Mites cause the aggravation of asthma in children with asthma who are hypersensitive to mites. In addition to mites, other major allergens are moulds and pet secretions. Moulds are found chiefly in damp and poorly ventilated rooms, and pet secretions in dwellings where pets are kept. Dampness causes the growth of spores and, consequently, moulds. Moulds irritate the respiratory tract and cause inflammations and hypersensitivity, which can trigger asthma or cause its exacerbation. The World Health Organization has concluded that, in children, moulds trigger coughing, wheezing in the lungs and asthma. Children living in damp dwellings face a higher risk of developing asthma – 1.5 to 2.2 times higher than children living in a suitable housing environment. Tobacco smoking is a lethal hazard and is the only environmental factor we can consciously avoid. Tobacco acts as an allergen and may induce production of specific IgE antibodies, which may cause allergy disorders, including asthma, in children (as well as adults). In addition to exposure to other allergens, recurrent respiratory infections, certain nutrition patterns and medicinal drugs, along with smoking (including smoke inhalation) are important factors exacerbating asthma symptoms. Globally, there is a very high rate of passive exposure of children to tobacco smoke. A study published in Poland showed that 4 million Polish children are exposed to tobacco smoke on a daily basis, at home or in public areas. Substances in tobacco irritate the respiratory tract. They cause shrinkage of airways, coughing and inhibit the self-cleaning mechanisms of the airways, which leads to more frequent infections (Stankiewicz-Choroszucha et al. 2011). According to the World Health Organisation, approximately 20% of the world population suffer from allergy disorders. The number of children with asthma in Europe has been increasing in recent years by 0.5% annually. An annual increase of 1% has been observed in Austria, which is comparable to Slovenia due to its geographical and cultural characteristics. According to 2002 data, about 15% of children in Slovenia had asthma, while the data on children with other allergy disorders is unknown. At the European level, the United Kingdom had the highest percentage of children suffering from asthma in age groups 6–7 years (more than 20%) and 13–14 years (more than 25%). The lowest number of patients with asthma in both age groups in the same period was recorded in Albania (<5%). Differences between the countries may be attributable to differing lifestyles, dietary habits, socioeconomic differences and environmental or climatic factors. The awareness of the disease can affect the number of patients as well. 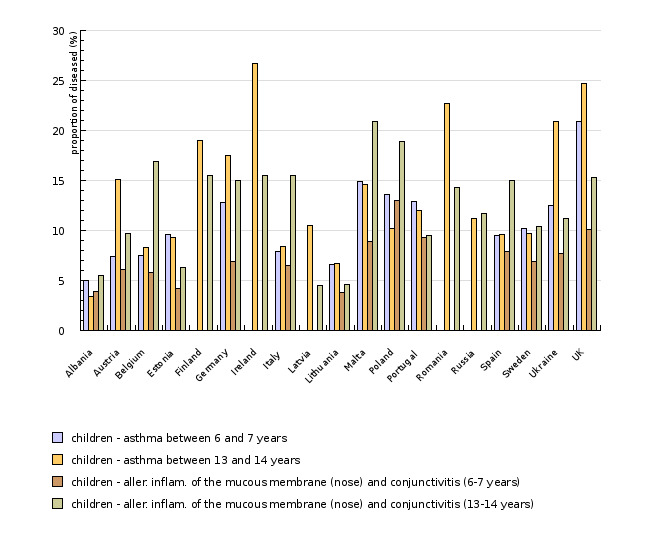 The data on the incidence of asthma and inflammation of the nasal mucous membrane and conjunctivitis due to allergies in selected European countries in the period 1999–2004 are presented in Figure ZD2-3 (ENHIS, 2007). In Slovenia, data on admissions to hospitals for asthma and other respiratory diseases is available. Most hospital admissions for asthma in children are recorded in Ljubljana and Maribor. The shares of hospital admissions in the period 2002–2013 for asthma were 0–1.8% in children aged 0–4 years, 0–1.5% in children aged 5–9 years and 0–1.1% in children aged 10–14 years (National Institute of Public Health of the Republic of Slovenia, 2015). Hospital admission rates for asthma are low, which indicates that children with asthma in Slovenia are well treated on an outpatient basis, which prevents the exacerbation of asthma that would lead to hospitalisation. Prevalence of allergy disorders is on the increase worldwide, and especially in developed countries, which is a phenomenon largely attributable to the polluted environment and its harmful effect on the foetus during pregnancy (Hakimek and Tripodi, 2013). Among environmental factors, pollution from traffic is probably the greatest threat to children's health. Living in the vicinity of major roads is correlated with higher hospital admission rates for asthma in children, decline in lung function as well as increased prevalence and severity of coughing and allergy rhinitis. In general, the risk of asthma in children living 75 metres from busy roads is approximately 50% higher than in children living more than 150 metres from busy roads (McConnell R et al., 2006). In Ljubljana, 12% of inhabitants live 75 metres from roads. According to rough preliminary data, approximately 8% of children aged 0–17 years have asthma. Approximately 250 children aged 0–17 years have asthma due to busy roads. PM10 and ozone are air pollutants that most frequently cause harmful health effects. A mechanism that causes these effects can be attributable to oxidative stress, in which reactive substances (radicals) are formed that may damage the human genotype (Kim B.J., Hong S.J., 2012).